Their pre-wedding ceremonies have kick-started and the pictures and videos are mesmerizing. From their mehendi look to their engagement clicks the two look made for each other. They are all set to get hitched tomorrow but before that here are the pictures of the couple, who will make you say ‘aww’. Marriages are made in heaven, they say. And we have yet another celeb couple to make this sound true. 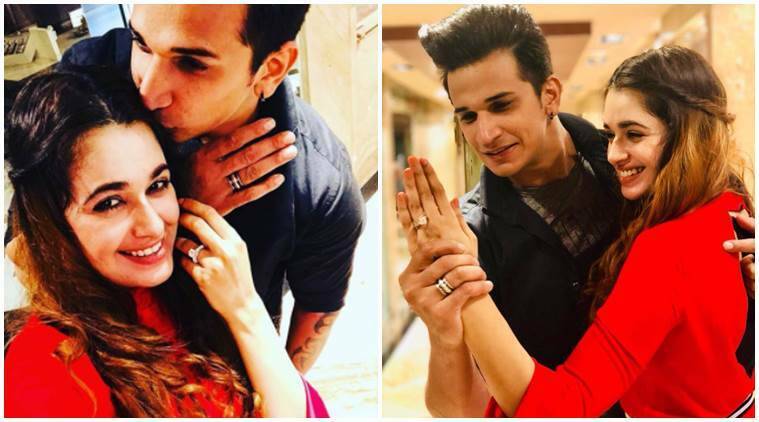 Popular Bigg Boss 9 couple Prince Narula and Yuvika Chaudhary have solemnized their bond in a traditional wedding ceremony amidst family and friends today. We have seen their dreamy pictures from the pre-wedding shoot to the cocktail party, mehendi and sangeet ceremonies and we are not done gushing over this lovely couple yet. And now, here comes the first picture of the bride and the groom as they now pronounce themselves as mister and missus Narula. Goes without saying, this is the most adorable telly couple in town. After dating for a couple of years, Prince and Yuvika finally got hitched at a posh sea-facing hotel in suburban Mumbai. Prince wore a silver-colored sherwani for the D-Day. His mom and dad decided to go color co-ordinate in deep blue. Some time back, we saw a cute video of Yuvika Chaudhary with her mehendi, choodas and kaleerein. Prince made his way to the mandap like a true prince charming and Yuvika looked a stunning bride. Prince Narula and Yuvika Chaudhary made for each other one of the cutest and adorable couples of telly town. They met on the sets of Bigg Boss and while Prince was head over heels for her at the first sight, Yuvika took her own time. But Prince’s charm was enough to bring out those much-awaited words from Yuvika’s mouth. They became friends and slowly they took their friendship to another level. And soon the two are going to be together for the rest of their lives. The couple is all set to exchange wedding vows tomorrow, October 12, in a big fat Punjabi wedding. Earlier, talking about their marriage, Prince had said, “We will be getting married in October or November, this year. It will be a big fat Punjabi wedding. The marriage destination is not yet decided but might sure before this year ends, Yuvika will be my wife.” Yuvika also said that “It will be a grand wedding.